Filipino weddings are an impressive fusion of modern and historic customs. Traditionally, these cultural weddings are a celebration of two families coming together rather than just the two individuals. The strong family influence, alluring attire like the Barong and Filipiniana, and traditional Tinikling folk dance are just a few unique Filipino wedding customs. Be sure to check out our blog for the latest Filipino nuptials. There is an assortment of Filipino wedding traditions with a majority of them being drawn from the Catholic religion. With roughly 80% of Filipinos being Catholic, it has become customary for Filipino weddings to be held in a Catholic Church where many rituals and readings take place. Each ritual signifies the important values of marriage and the union of two individuals. This makes it the most intriguing and sentimental part of a Filipino wedding. Beyond the bridesmaids and groomsmen, the Filipino wedding includes many more significant members that have been a part of the couple’s life. Filipino couples often honor these important guests with the title of Principal Sponsor or Secondary Sponsor. The number of sponsors can vary from a single couple to multiple couples. During the ceremony, sponsors are invited to join the bride and groom in the prayers of blessing. There are four sets of secondary sponsors including Coin Sponsors, Veil Sponsors, Cord Sponsors and Candle Sponsors. 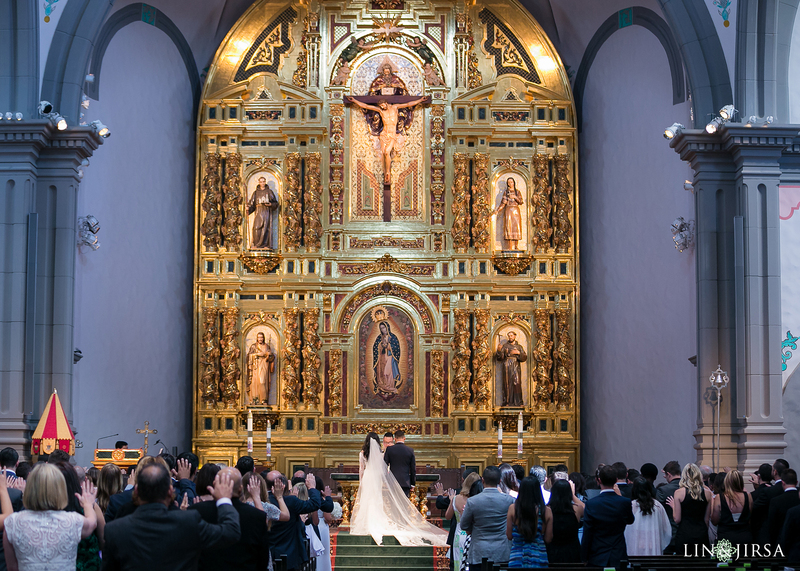 These sponsors are aunts, uncles and extended family incorporated throughout the wedding ceremony to partake in the long-established Catholic rituals. Exactly 13 Arras, or coins, are carried in a pouch and brought to the altar by the coin sponsors. The Arras are then blessed for the groom to gift his bride as he promises the welfare of her and their future family. Traditionally, the promise is made by the groom, however, today’s couples are more mutually supportive than ever before. The coins are an emblem of their future children and before the church, the bride and groom promise their care and love. 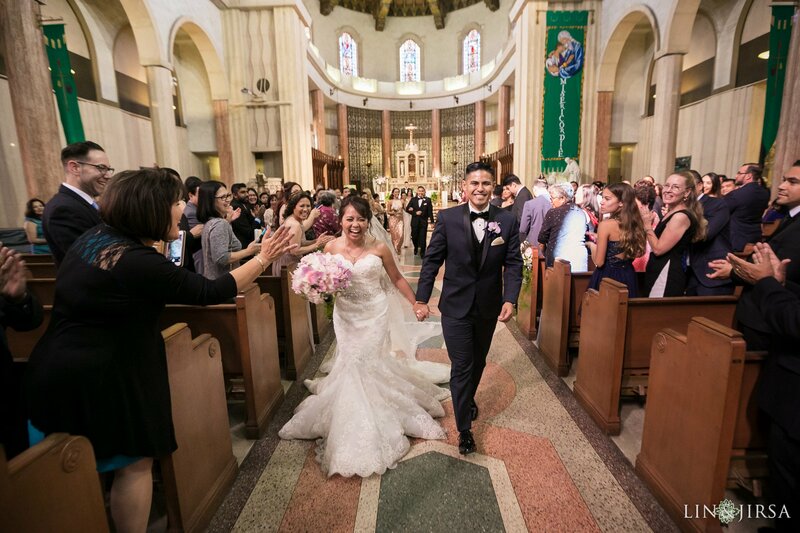 Through the Catholic veil ceremony, two individuals are bonded and recognized as one. The veil sponsors drape one side of a white veil over the bride’s head and the other side over the groom’s shoulder as a symbol of unity. This also represents a wish for good health and protection during their life as husband and wife. Similar to The Veil Ceremony, the Yugal or infinity shaped cord is incorporated as a representation of the couple’s bond and union. Their sponsors will place the Yugal on top of the veil as the couple receives their blessing. This is the final ritual symbolizing the bonding of two individuals and in Filipino culture, two families. 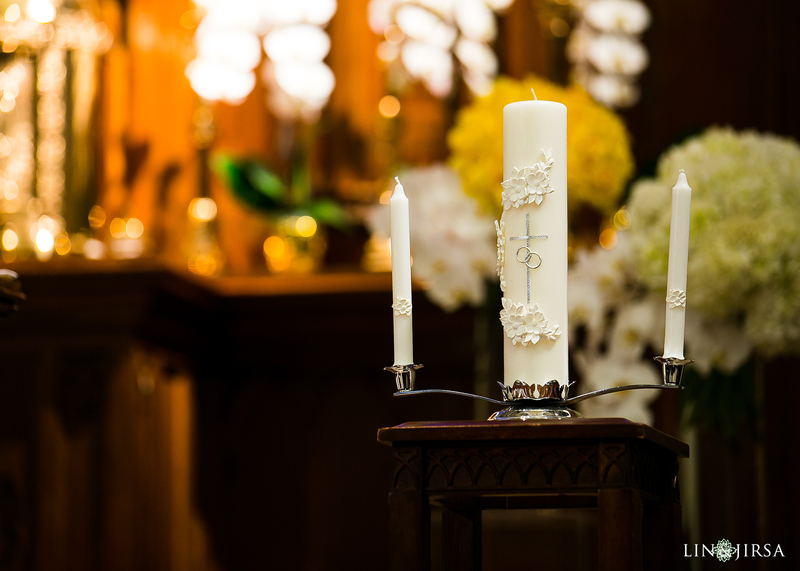 The two outer candles are a representation of their individual lives before the wedding day. The candles exemplify all that the bride and groom are from their past experiences and represent each individual family. Together, the bride and groom will light the unity candle, blow out the single candles, and figuratively extinguish their past. Traditional Filipino wedding dresses are quite unique! The Filipiniana is often a two-piece dress with enormous butterfly sleeves and made with fine quality fabrics, impeccable embroidery, and vibrant colors. Modern Filipino wedding dresses have evolved over time into the elegant white gowns you often see, but with a slight resemblance to the Filipiniana. A majority of contemporary Filipino brides choose white gowns with elaborate embroidery and smaller butterfly sleeves. More commonly known as the Barong, is a traditional Filipino shirt that is expected to be worn by the male family members at formal events. Barongs are commonly lightweight, embroidered along the front in a U-shape pattern and often handmade. The Barong is casually worn untucked and over an undershirt. Just like many other cultures, Filipino wedding receptions are dedicated to celebrating the new Mr. and Mrs. Family and friends join the newlyweds for a night of emotional speeches, delicious food, and infinite memories. What is a Filipino wedding without Filipino food? The delicious ethnic food is a must on your wedding day. Although there is no set in stone menu for Filipino weddings, selecting a Filipino caterer would be a treat for wedding guests. Lechon, Longganisa, and Kaldereta are just a few options for a tasty dinner. The Money Dance is also known as The Dollar Dance or The Apron Dance. No matter what you choose to call it, this tradition is a fun one that many cultures choose to include during their reception. The DJ will ask the men and women to line up in separate lines, grab a pin and wait their turn to dance with the bride and/or groom. The money received during the dances is perceived as a sign of good fortune, while also financial assistance as they begin their journey as husband and wife. The rich Filipino heritage includes a unique collection of classic dances that pay tribute to Filipino history. It is common to include these traditional dance performances during dinner or at some point throughout the reception. Some of the folk dances include The Itik-Itik, The Sayaw sa Bangko and The Pantomina. (Left) is The Tinikling, recognized as the Philippine’s national dance imitating the movement of a bird as it walks between tree branches. As industry leaders, we also hold in person and online workshops for both aspiring and established wedding photographers. If you’re interested in attending our workshops, be sure to click here for more info. If you’re a photographer interested in learning more about how to shoot cultural weddings, including Hindu, Jewish, Persian, Vietnamese, Korean, and Chinese weddings, we recommend our wedding photography education, available at SLR Lounge.